Susana Goggi, associate professor at the Iowa State Seed Science Center, developed the first publicly available biological test for Roundup Ready soybeans. The test was rapidly adopted nationally by private and public seed-testing laboratories. Iowa State has built a strong reputation for innovative research on viral-based soybean diseases. 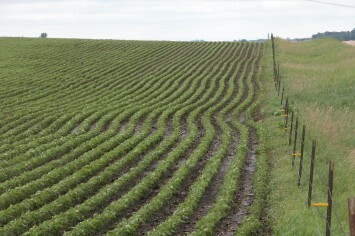 Led by plant pathologist John Hill, the researchers have scored several breakthroughs over the years, including development of a viral technology for identifying genes involved in protecting soybeans from bacterial pathogens; studying bean pod mottle virus strains to better understand how the disease develops and evaluating the effectiveness of management strategies; and developing technology to track released virus strains through disease epidemics caused by the soybean mosaic virus. In 1999, Hill and his colleagues developed the first stable, genetically engineered disease resistance in soybeans. Iowa State plant pathologists made a breakthrough in 2012 in deciphering how plant-parasitic microscopic roundworms called cyst nematodes infect plants, like soybeans. Thomas Baum, chair of the plant pathology and microbiology department, worked with associate scientist Tarek Hewezi on the research. Cyst nematodes feed on plant cells by penetrating the host plant’s roots. The soybean cyst nematode is considered to be the most serious pathogenic threat of soybeans and is estimated to reduce returns to U.S. soybean producers by close to $1 billion annually. The researchers’ new approach was studying microRNAs, which are powerful regulators of gene activity. Mycotoxins are chemicals produced by fungi that are harmful to humans and domestic animals. Because fungi that produce mycotoxins in maize are frequently associated with insect damage to the plants, insect control may reduce mycotoxin concentrations in grain. Gary Munkvold, an Iowa State seed pathologist, and colleagues were the first to recognize and report the mycotoxin-reducing capacity of transgenic Bt maize. This work has positively affected public policy and regulatory decision-making for transgenic crops globally, and the economic benefit to farmers has been estimated in the tens of millions each year.